There’s a very large book on my book case, not yet slipped into its correct place as I await delivery of more bookshelves to house it and those others that currently sit in the recently read and to-read piles (I find this fitting given a certain passage within this very book). Large in terms of size, epic in terms of the scale it covers and immense in its brilliance. It’s Confessions by Juame Cabré. I was sent it to me to read and review by the great folks at Arcadia Books. I’ve hemmed and hawed over this review for some weeks now. That’s not to say I didn’t enjoy the book. Far from it. I loved every single word of it. It’s nothing short of a masterpiece. My procrastination was due more to wondering just what I could add to the no doubt miles of column inches that already sing its praises. While Confessions has been compared – and rightly so – to books such as The Shadow of The Wind, The Name of the Rose and The Reader – I can’t recall the last time I read a novel as affecting as this. While it does contain similarities to the aforementioned – neither they or any book I’ve read for some time has made me run the gamut of emotions in such a way as Juame Cabré does within these seven hundred or so pages. Within the opening pages Adrià ponders where to start, perhaps 500 years ago “when a tormented man decided to request entry into the monastery of Sant Pere del Burgal”. Instead he starts with his own childhood. Adrià’s father is a man obsessed with possessing ancient treasures and manuscripts and is an authoritarian dictator in his home. Toward his son Felix Ardèvol shows no affection. Adrià’s mother is equally aloof and cold: “Mother, on the other hand, was just Mother. It’s a shame she didn’t love me”. Alone in his own home and childhood, Adrià occupies himself by spying on his parents – a network of hiding places and peep holes – and confessing in his only companions, Black Eagle and Sheriff Carson; two small toys. Even these he has to keep hidden from his father, How. It’s a master-stroke. Starting the narrative though the eyes of a young boy, starved of demonstrative love and driven hard by his all-controlling father, I read the entirety of the events as though seen through such innocent eyes, making all that unfurls as the stories emerge and intertwine all the more affecting. At first the structure of the narrative can be a little hard to grasp but following the realisation that our narrator is writing as the dementia takes a grip the reasoning becomes clear – stick with it, it all soon flows together beautifully and when the links between each narrative thread are revealed it’s akin to magic – from rivalry in a medieval village and the fate of Jachiam of the Muredas after he commits murder, back further to the Inquisition and it horrors, through to the crafting of Vial and on to the 18th century and on to the wave of darkness that Nazi rule threw over Europe and the stomach-churning experiments at Birkenau. I’ve read a number of accounts from this particular nadir of humanity both fictional and non. I don’t think any of those have hit me as hard as those in Confessions. I don’t mind admitting that I had to put the book down and stop reading at one or two points. While I’m at it I don’t mind confessing that it also bought me to tears in a number of places. Like I said: no other book has made me run the gamut of emotions in such a way. Yes this book has its dark points but it’s also shot through with light. It’s bound by merriment and humour just as much as it’s haunted by tragedy and steered by mystery. The various narrative threads all link together and all contain enough plot twists and revelations to drop the jaw. The characters are rich, the plots enthralling and reading Confessions feels like absorbing the most detailed and resplendent of artworks. It is a big book but it’s an important one, every word is essential, rich and rewarding. Much like Storioni’s Vial, Confessions is the work of a true master and contains every element in perfect balance. That it’s sold over a million copies and ranked as an instant best seller in 20 languages already is no surprise. If it had sold ten times that it wouldn’t surprise either. Mara Feye Letham most certainly had her work cut out in translating this novel and keeping its unique narrative and style yet it doesn’t show; the novel flows beautifully through her translation. Confessions gave me something I hadn’t experienced in a while; a book hangover. It was a few days before I could do more than scan a paragraph of another book. 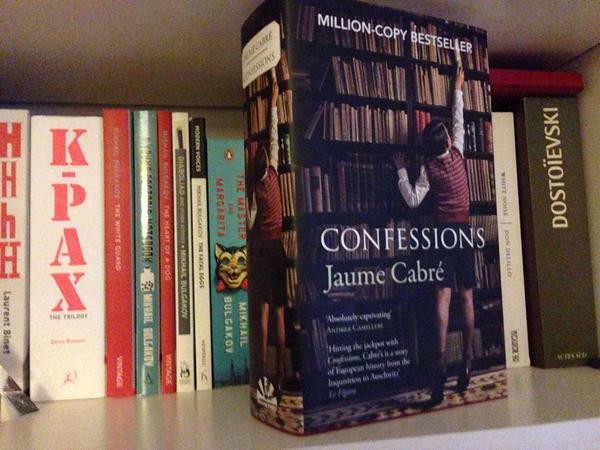 Juame Cabré has crafted a monumental novel in Confessions, one that will linger and continue to deliver long after turning the final pages.